Motorola launched another great looking headset: The Motopure H12 Universal Bluetooth Headset. 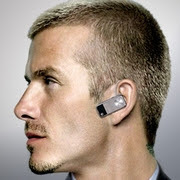 I don't know whether it's the headset that's great looking or maybe it's because it's in David Beckham's ear that's making the Motopure H12 look so delicious. The Motopure H12 has a Diamond cut metal, high gloss black top, spun metal accents, and a soft touch back design...Now that I look at the Motopure H12 more closely, there's really nothing great about its looks so yeah, it is David Beckham who's making the Motopure H12 look savvy. For more information about the Motopure H12, head on over to Motorola's website.